Nearly a week ago, we told you about a piece of tech history that was being auctioned off online by RR Auction. 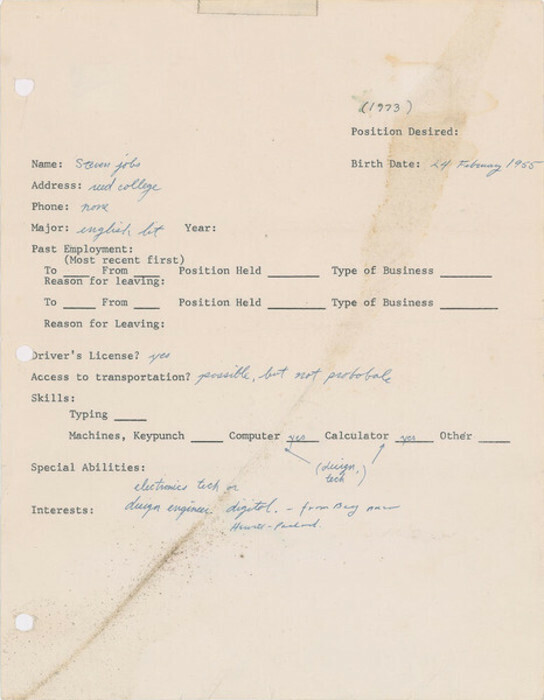 To be sold to the highest bidder was a job application for an unknown position, that was filled out by Steve Jobs in 1973. Roughly three years later, Jobs and Steve Wozniak founded Apple Computer. Four years after that, Jobs was a millionaire when his company went public. However, back in 1973, when Jobs filled out the application, he didn't own a car or a phone, and he wrote that access to transportation was "possible but not probable." When we last checked in at the auction, the high bid for the document was $50,000. Now, the auction is over and the paper signed by the 18-year old future executive was sold for $174,757. To put it another way, instead of spending that amount on Jobs' job application, the buyer could have purchased a little more than 981 shares of Apple at current prices. Or, he/she could have bought 166 256GB Apple iPhone X units. The difference is that the document is a one of a kind item that is more than just a mere conversation piece. The winning bid is said to have come from an anonymous internet entrepreneur who lives in London. To see how much Steve Jobs memorabilia is valued by collectors, consider that RR Auction's current lot of Americana includes a letter signed by Martha Washington and stamped by her hubby, a missive written by Ben Franklin, and John Hancock's John Hancock. All of them have estimates well under the $174,757 that Jobs' application fetched. And the latter document wasn't even signed by the Apple co-founder. 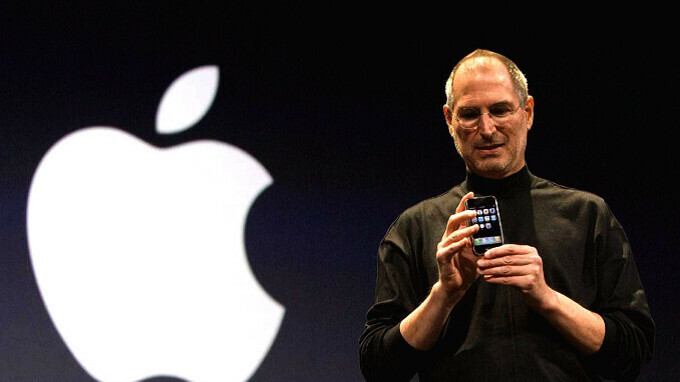 The bottom line is that for all of the important achievements that these men accomplished, it was Steve Jobs who unveiled on the Apple iPhone on January 9th, 2007. Even if I had a trillion dollars. This is the last thing I would ever want in the universe. Each to his own I guess. Some people do not deserve to have money or be rich. Wow!!! The biggest scam ever. lol. So instead of getting a exotic sports car, house, boat, small island or anything else, you spent thousands on a old piece of paper. Uhhh, think about it dummy, most likely anyone that could afford to spend so much on an old piece of paper already has multiple exotic sports cars, houses, boats, private island or pretty much anything else they want. And literally everything OP posted besides the island (which is dumb for other reasons) happens to be depreciating assets lol. Nobody rich enough to pay this much for a piece of paper hasn’t thought about the long-term investment said paper carries. In a decade or two, this item will be worth double the price EASILY. Smh. Point of my post was to say that I'd rather spend my money on something else dunce. I can't take you serious simply because of your improper usage of AN (not a) indefinite article. Cool. Guess I gotta change it to an Apple logo for my opinion to be taken seriously by you? The Mona Lisa contain art produced by one of the greatest artist in history , sure it should not get value of 620 million , not even 1 million . Money should be spent wisly , once there is no one on the face of the Earth is hungry , thirsty , in need of cloths , in need for shelter or in need for job . Only then can papper worth thousand or millions . When will human be able to see what is important in life ???? If true I believe the pricing on that is ridiculous as well, but in it's defense it was drawn by one of the most brilliant minds nearly half a millennia ago. Now compare that to a poor resume written by a CEO 45 years ago. But yet it's still just a piece of "paper" that does no more for anyone than Steve Jobs, job application. Only Apple's consumers could be that moronic to pay over 174k for a 45 year old piece of paper. Considering a painting was sold for 500mil just recently nothing ever surprises me anymore. You can't compare a painting that hard work was put in to it and took days to paint to a piece of paper that took 2 seconds to sign. I'm guessing the buyer is a person where if they lost a few hundred thousand dollars tomorrow it wouldn't have any impact at all. For that person, the value of money is different than it is for the rest of us. In that context, this is an interesting conversation piece to put in the home. Good for that person, I suppose. I'm not a fan of collecting autographs and the like, but I get the interest from a collector mentality, and if that money doesn't mean anything, why not?